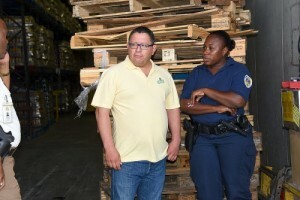 WILLEMSTAD - The general manager of the wholesale company Hector Henriquez B BV has been arrested on suspicion of forgery of documents and the violation of various food safety laws. The suspect will appear before a judge on Monday morning to confirm his arrest. The suspicion is tampering with documents such as labels, packaging and multiple origins of different types of products imported by his company. The manager had been warned earlier this week after an inspection of the multidisciplinary team. Last Tuesday, an illegal bakery was discovered inside the company, delivering bread to the prison. Yesterday's inspection showed that the labels of different products that are past their expiration date have been tampered with. The multidisciplinary team headed by the inspectorate of the Ministry of Economic Development already indicated that they will no longer tolerate this kind of practice. Certain groups in the community already indicated that they will press charges against the wholesale company and also other companies who make themselves guilty of these kinds of practices. They also indicated that if the Public Prosecution does not accept their complaint, they will go on hunger strike to demand the attention of the authorities.